Cream was a chemical explosion like no other, the blueprint for every supergroup to follow and the heavy blues precursor to Jimi Hendrix, Led Zeppelin and so much more. 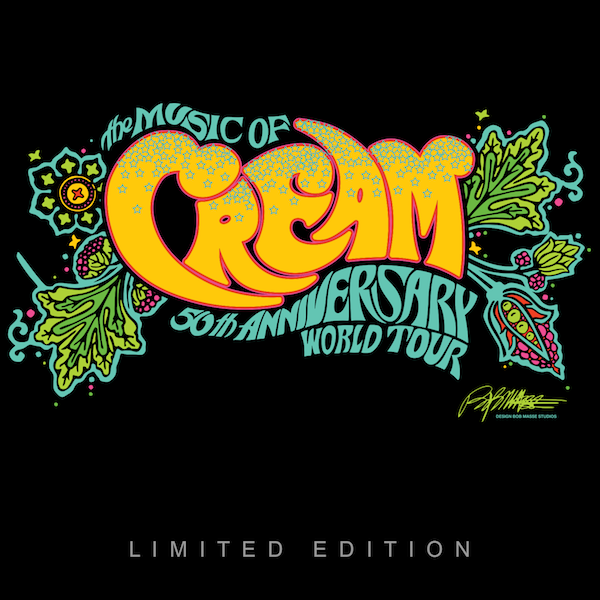 After their successful inaugural The Music of Cream 50th Anniversary World Tour in Australia and New Zealand in 2017, Kofi BAKER (son of Ginger) and Malcolm BRUCE (son of Jack) unite with Will Johns (Eric's Nephew by marriage, and son of Zeppelin/ Stones/ Hendrix engineer Andy) to unleash the lightning that electrified a generation in an extensive World Tour. DiscLive, through our partner VNUE, will be there to capture every note, and release Limited Edition Numbered Double CD sets to fans right after each show! Feel the fire and the freedom of "Spoonful", "Strange Brew", "Sunshine of Your Love", "White Room", "Crossroads" and "Badge"  Listen to the stories and see them interplay with their mentors on the big screen  master musicians whose lives have been steeped in the Cream spirit, celebrating an extraordinary legacy. DON'T MISS THIS ONCE-IN-A-LIFETIME CONCERT SALUTE TO THE MOST INNOVATIVE AND EXPLOSIVE SUPERGROUP OF ALL TIME, IN THE HANDS OF THOSE THAT KNEW THEM BEST.